Well, it looks like the detritus of HVCC has finally come full circle. AMS (services vs companies) are on the fast track to replace AMCs. AMCs that foster their use haven’t realized that yet. They have given the lenders the tools needed to avoid costly appraisal management oversight departments while at the same time giving them the ability to use only those appraisers willing to make the deals work. They mistakenly believe that by delegating to an AMS or AMC they have met their due diligence requirements.Quality control? Sure. Just ignore the FNMA license restrictions on CU as most are already doing, and use that in lieu of meaningful QC. After all, how can a lender using all FNMA’s or Freddie’s, etc. wonder-tools be held accountable if those tools don’t actually work? They mistakenly believe that by delegating to an AMS or AMC they have met their due diligence requirements. An oversight I am sure FDIC will remind them of when the loans go bad when the inevitable claims are made. Any appraiser whose work has a CU of over 2.5 gets to address ALL the items listed in the SSR (summary of CU). Lenders won’t really care what the answers are as long as they kicked it back for comment. It’s an insured loan. It’s been processed using FNMAs Day1 Certainty program. Those with a CU score of 2.5 or less are deemed acceptable by default per FNMA. Coupled with the proliferation of specialty forms, and exceptions to USPAP, we now have services that allow lenders to populate their panels with appraisers especially chosen by the lender for their demonstrated willingness to ‘play ball’. It’s not even necessary to blacklist appraisers anymore. Simply do not include them in the selection roster submitted by the lender to the AMS for use in their deals. What could go wrong in such a system using modern technology combined with all that “Big Data” added security? Is anyone old enough to remember the government’s adoption of food industry studies back in the 1960’s and 1970’s to curb ever increasing obesity? With extremely few dissenting voices, the studies (funded by the sugar industry) determined that fat in foods was the culprit. Government food supply regulators even promoted that fraud. Hence the proliferation of nonfat, low fat and tastes just like fat, and “I can’t believe it’s not fat” type foods ever since… and the continued rise in heart problems and obesity among the population overall – despite increased exercise and health awareness. Why even fast food restaurants have to label caloric content… or an approximation of it (say within 20% or so). Heck, that’s actually more accurate than regression analysis is for salient features market characteristics & value contributions! Despite actual medical science now showing that the real culprit was ever increasing amounts of sugar introduced into almost all processed foods, the legacy of all that past “big Data” and government adopted studies funded by special interests is a useless forty billion dollar a year industry. One that is here to stay. An industry that has grown around selling folks on the idea that (1) skinny is good, and (2) that the cause was and remains too much fat, and (3) that the solutions can be made painless and with no effort by using cutting edge short cuts. Short cuts that ‘scientific studies’ have proven to be ‘x’ times more effective than common sense and good habits alone. Not unlike the Big Data Dogma Cult hybrids and short cuts that are the current darling of FNMA, MBA and ABA. There is no need for an appraiser; independent expert opinions or even actual compliance with state or federal laws that can now be more easily sidestepped. Just look beneath the sugar coating of the growing new service industry available to lenders. I have no particular ax to grind with the company shown in the screenshot sent to me; except their first descriptive paragraph of what they were designed to do, doesn’t reconcile to the comments contained in their approved appraiser panel section. If the lender is the one selecting the appraisers anyway, then what exactly is it that they do? Collect a fee from the consumer-borrower that is double what they will grant to the appraiser? How is a company that offers fantasy FIRREA & Dodd-Frank compliance going to “strengthen my integrity OR independence?” If I felt they actually knew what they were talking about, I’d be insulted. However, I appreciate that their verbiage was carefully chosen to hit all the warm and fuzzies of their intended clients. It’s marketing gibberish without substance. Clients that don’t really care about “valuation” quality, integrity or independence of the appraisers hired…as long as they can still chose their own at a cheap price and guarantee to get the results they seek, while maintaining the illusion of appraisal independence & FIRREA /Dodd-Frank compliance. wow!.. fraud by any other name?? The Author has a creative way of spinning the message somewhat similar to that of modern day Media. Contrary to the Authors illusions, Regulators do in fact permit legacy appraiser panels. Additionally, Regulators permit ‘Approved Appraiser Panels”. In fact, if you dissect Regulator demands around 3rd party vendor relationships and management thereof, a Mortgage Lender should be very cautious working with Appraisers whom they themselves have not vetted and approved as qualified and acceptable to meet Regulator minimum requirements as a qualified 3rd Part Vendor. Thus, a Lender utilizing an AMC who distributes appraisal orders to Appraisers that have not been properly vetted by the Lender themselves could potentially be in breach of Regulator rules. Therefore in theory, all Mortgage Lenders should be working with an “Approved Appraiser Panel”. Frank Danna, thank you for the creativity compliment. However, the ONLY spin about the ad and article is your own. It is YOUR firms verbiage rather than mine, that state unequivocally that you will ONLY use the lenders selected appraisers unless they tell you otherwise. IF your ad is to focus on the ability to use “legacy” appraisers, then why not say so? In fact if your “theory” is correct, then why not tell the lenders that they should be using services like yours or risk being non compliant? Don’t take my word for it folks. Read Franks own firm’s comments in the graphic above. Click it and enlarge for easy of reading. See “Approved Appraiser Panel” on right side of picture above. Frank if it is necessary to dissect rather than merely read and understand common language regulations in order to conduct routine business, then perhaps your services are just a wee bit too close to that line between being acceptable legally, and morally…and those that are not. Don’t take it personally, with amc’s it’s easy to cast a broad stroke. I agree though, all lenders should have limited panels. Per below, that can’t work without also following other standards. Let’s be honest, all amc’s shop or chop the fee because no amc’s are able to justify an additional fee over comparative lender direct C&R. I’ve never met an amc who did not advocate for the lender client. None of us would mind working with amc’s if we were not the ones paying for the service. Don’t need it, find no value in it, and why would we split a fee with a group whom advocates against our best long term interests? Bidding, alternative value products, downward fee pressure, speaking on behalf of licensed appraisers when amc persons are not licensed themselves, it all adds up to being red pilled and it’s unacceptable practice. Eyes are opening every day. I continue to hold out hope that amc’s and appraisers can work together. That starts with clearly separated fees for distinctly different services and a rollback of influence on behalf of the amc’s. Originator, order steward, valuation analyst. Agree Baggs, I even know AMCs that would prefer a cost plus system and payment direct from lenders for their services. Only thing stopping that though is that the competition would do the same to thing to their fees that they did to ours. That and the fact that lenders managers who select the AMCs could no longer solicit and accept under the table kickbacks on a per order basis ranging from $25 to $50 each. I have never heard the name Appraisal Logistics before. I went on their website and found out these people are In-House. I had two clients use them and dropped them pretty much immediately. These are the very same people that tried to deduct their fee from the appraiser’s fee about a year and a half ago for the use of their portal. There was a question of ethics at that time and it appears nothing has changed. Thanks for the article Mike but what’s the difference between AMS and AMCs? What does AMS stand for? Appraisal Management Services? Because to me AMS always meant American Measurement Standard. 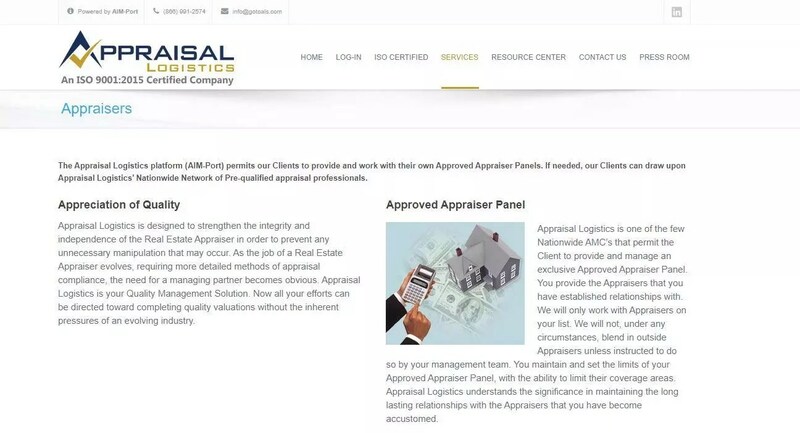 BigAl, As used and possibly usurped “Appraisal Management Service.” It appears to be an attempt to sidestep two troubling problems AMCs have: (1) licensing & state regulatory requirements in all states; (2) Having the ability to undercut competition without having to worry about C&R. In some states if they limit themselves to a clients self managed appraiser roster they may be able to “dissect” the regulations and sidestep AMC licensing rules. Not sure it matters but I noted Mr. Danna is licensed in four different states per asc. MD., VA., DC and NV. – assume he gets a premium for driving out to do those Las Vegas appraisals. Appraisal Logistics are known for non payment and taking more than 90 days to pay. I did a few for them back in 2015, they payed poorly and were extremely slow to pay. They are in my “UGLY AMC” list. AL is o.k., I raked a few good fees out of them in the busiest days. For dedicated panels, nothing beats that. However, grading and shopping ruins the approach. “If an appraiser is considered good enough to be on the approved panel, they should expect a fair share of work.” In the spectrum of amc’s, I’d still work with ALS if I did not have direct assignment clients to prefer first. Nicer staff, different approach. I would have stayed with them if they did not insist on micromanaging every single order and trying to shop terms. Edit, picture remove. Baggs, Nice to hear something positive but you seem to be of two minds. They are nice but then they micromanage??? Being forced to bid everything goes against the spirit of peer standard, fairly applied fee ethic. We’re all supposed to have a defined fee and apply that fairly to the client category. On the other side, some appraisers really do dial it in, they’ve become accustomed to finding client acceptance based on their fee (aka profit incentive for the amc), rather than quality work. It’s become easier than ever to scoop quality clients with old fashioned detailed methods. See addenda, 48 hour flips, mobile reporting, under valued quickie methods have become the staple. A return to limited panels and longer turn times is what is necessary. However, that model can not work without also integrating consistent reliable fees. One puts the cart before the horse to argue proximity and volume limitations without first answering the critical questions of advocacy vs non advocacy. Keep up the good work Mike, always enjoy reading your articles. Thank you Baggs! Absolutely concur re last posted comments re ethics, fees, income stability, TAT etc. Well stated.